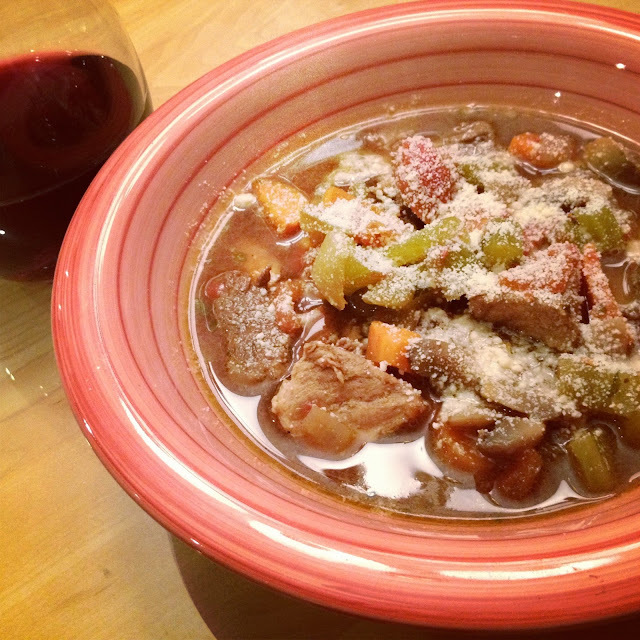 Frugal Fitness: Frugal Recipe: Mighty Meat Stew! Frugal Recipe: Mighty Meat Stew! It’s MARCH and the cold winter is (unfortunately) still here. In hopes of improving my mood, I downed some Vitamin D and made this stew. It’s simple, healthy, and hearty. Essentially you chop up some meat, veggies, pour in some broth, and cook it in the crockpot all day until you get home from work. Then you’ll have a delicious dinner just waiting for you to sit down and enjoy it. 1. Sauté mushrooms and onions together in a little bit of oil and water. Set aside when cooked. 2. Chop the beef and pork into chunky pieces. Brown with garlic, basil (or Mrs.Dash), olive oil, and a splash of red wine. 3. Combine mushroom and onion mixture with meat, celery, carrots, beef broth, and tomatoes in a crockpot. Stir and let it cook it on low for 5-6 hours or high for 3-4 hours. 4. Add one box of beef broth and stir.